Safety is a personal matter – which is why it needs a personal approach to be improved beyond the plateau. The SafetyDNA Program Add-Ons offer the tools you need to transform safety into a personal experience with a tailored approach to your organization. Designed to meet your organization's unique needs while complementing the foundation of the SafetyDNA Program, the Add-Ons enhance safety developments in the areas that are most adequate for your organization. Empower your workers to own their personal safety in a new way and share this commitment to safety improvement with others. The SafetyDNA Coaching Program offers a well-rounded foundation on interpersonal skills, peer respect, and most of all, a strong commitment to personal safety, with an extensive formation in safety coaching for individuals with all levels of experience. By completing this Program and earning the SafetyDNA Coaching Certification, coaches have a meaningful impact on their coworkers' individual safety, becoming important assets to the company’s overall safety strategy. The Program includes three 2-hour instructor-led, online learning modules – for a total of six hours of online training. With a biweekly frequency, the Program allows time to apply the learnings of the week before the next module. At the end of the Program is a short certification exam. Discover the benefits of improving site safety with a focus on task risk exposures. The custom TaskDNA™ materials offer a targeted solution to transform your worksite with a shared common language, for ongoing individual safety improvement. The custom TaskDNA materials take a personal approach on the unique exposures that are present on your worksite. 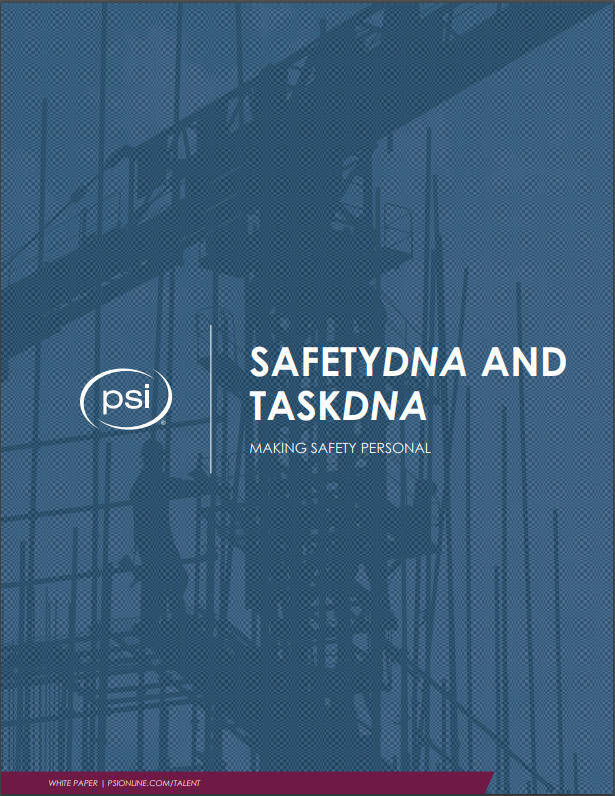 By investigating the nature of the exposure task in terms of SafetyDNA, these materials derive an accurate and practical interpretation of your exposures for your workers to reference while completing their job tasks that are unique to your job site. This offer includes digital TaskDNA posters, Toolbox Talk Cards, and brief report associated with the specific task analyzed. This way, you can improve your site safety with a personal approach, and own the developmental experience your workers have when discovering exposures in their day-to-day tasks. Looking to gain a better understanding of your current safety culture, to proactively improve your site safety? Turn to your employees, to discover their own view of the safety standards they experience on their worksite, every day. Our Safety Climate Survey offers a close insight into your true site safety, the one that your employees work with and sustain on the job. By gathering information on employees' perceptions of the safety culture at their worksite, based on 9 essential safety culture factors, you can gather actionable insight on site safety. The Survey Report, rich in trend and benchmarking data, allows you to integrate the detailed data from the survey into onsite workshop discussions and promote improvement in a focused way. It’s one thing to read about the power and accuracy of safety assessments and programs – but it’s another thing entirely to experience them for yourself. Fill out the form to the right to talk to one of our safety experts and find out how our assessments, training and programs can help your organization. Safety Starts with the Individual. Safety professionals have been limited to dealing with personal safety from the external perspective, by just putting a physical barrier between the worker and the workplace exposures. They include P.P.E., yellow lines on the floor, railings, machine guards, and more. Despite the billions spent each year on external safety, we know it isn’t enough. We still see approximately 500,000 serious injuries each year, with over 4,000 workplace fatalities. Your organization should look to focus on the internal side of safety. All individuals possess these psychological traits, known as SafetyDNA, that ultimately determine their safety behavior. The recent breakthrough in SafetyDNA research finally provides conclusive evidence that internal safety traits are the key to understanding personal at-risk behavior and injuries. If this is new to you, consider downloading this whitepaper. Interested in learning how companies have been using our SafetyDNA hiring and development solutions to improve their safety culture and performance? Click the link below to have access to our safety business case study library and client result videos.